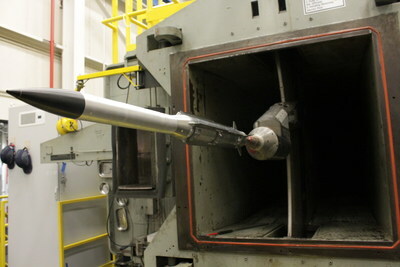 TUCSON, Ariz., Feb. 18, 2019 /PRNewswire/ -- Raytheon Company (NYSE: RTN) successfully completed more than 1,700 rigorous wind tunnel tests on the newest, extended-range variant of the combat-proven AMRAAM® air-to-air missile. Testing is a major step in the missile's qualification for integration with the NASAMS™ surface-based system. "During these tests, we put AMRAAM-ER through a full range of potential flight conditions to validate the missile's future performance on the battlefield," said Kim Ernzen, Raytheon Air Warfare Systems vice president. "Raytheon is developing this missile to enhance ground-based air defense for our customers worldwide." Manufactured by Raytheon and Norway's Kongsberg Defence & Aerospace, NASAMS is the most widely used short- and medium-range air defense system in NATO. NASAMS provides a high-firepower, networked and distributed state-of-the-art air defense system that can quickly identify, engage and destroy current and evolving threat aircraft, unmanned aerial vehicles and emerging cruise missile threats.